Most members are in possession of the new cleats. We believe the cleats tell a story of how much still has to happen in order for our relationship with the City of Calgary to work properly. We were informed cleats were a solution to the number of slips, trips and falls that occur in the workplace. For the record, Local 583 cannot support the use of the cleats for a number of reasons, the most obvious being the cleat should fit seamlessly into the midsole arch of our footwear and it doesn’t! We believe the process would have been much better had we been invited to discuss how the incidents of slips, trips and falls could be reduced. In fact, our belief is changes to Provincial Occupational Health and Safety rules make such consultation mandatory. This is not the only item which ATU 583 has not been involved in. Other items where decisions were made without our input include: the LRT Series 9 Operator’s seats, the after-market seatbelts on Conventional buses and the new Nova buses that will be housed at the new garage at Stoney Trail. 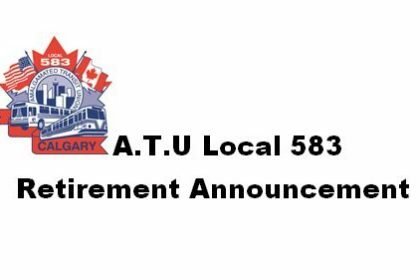 ATU Local 583 has gone to the Province to ensure Calgary Transit is compliant with all aspects of Health and Safety and an OHS Officer has been assigned to the investigation. The new Stoney Transit Facility is set to begin operations in March 2019. From our understanding the facility is near completion at the time of this writing and there will be significant resources required to get the facility up and running. There will be Town Hall meetings posted and scheduled for the middle of this month for the Maintenance employees to learn about the new facility and the sign-up process that will take place on December 4th and 5th, 2018. From our understanding, Calgary Transit takes possession of the building on February 1, 2019. There will be Compressed Natural Gas training provided to all Maintenance employees that will be working in the facility before service begins in March. As with previous sign ups in Maintenance, there will be a further sign up to allow for reversion rights within 6 months. Currently there are no growth positions and therefore when you sign up, wherever you sign up, the position number that you hold today will follow you to the signed-up garage. The membership has approved the purchase of new Boom Cards. These cards offer a multitude of discounts from arts and culture to reductions in insurance costs. This card is like an Entertainment Book in your wallet or on your key fob. When the cards come in they will be mailed out to all our members in good standing who are on file. As per the Bylaws, Article 105, which states members must update their information with the Union, please be sure we have your correct address as we will be mailing them to the address we have on file. Please also consider checking your beneficiary at this time, if you have our Group Insurance. Nobody wants their insurance benefit going to the wrong beneficiary. The City has been proceeding with their Code of Conduct training. It is mandatory training which all City Employees will receive. Employees who are “wired” will be trained online. Calgary Transit Operations, which obviously aren’t, will be classroom trained. If there has been any insinuation that the ATU Local 583 Executive endorses this concept, the answer is: We do not! How can we openly buy into a concept whose tagline is “If you see it, say it”? It seems not too long ago employees would lend a hand to protect each other: wave a buddy’s bus past a stop because you knew they were running late. Not now, because that might offend someone, what a shame. Not only does the average bus carry 40 bosses at one time, do we need to boss each other?! A month ago, the Executive of Local 583 was invited to a preliminary session of what was going to be presented to our Members. A common theme the Executive reiterated was “that won’t work at Transit”. After an hour and a half of discussion we still weren’t satisfied that this program wasn’t all about tattle-tailing on each other. Everyone has a different threshold for being offended and it felt like the City was responding to the most sensitive of needs. Also, there appears to be no option for an intervention of any kind; a chance for a Member to ask a friend or dare we say it, a Supervisor, to informally step in and de-escalate where needed. The meeting concluded with us in disagreement with the City’s mindset. Two weeks into the training, which included Local 583’s suggested modifications, one of our Stewards was in a session and reported that the facilitator said “ATU 583 was in support of the Code”. Instantly an email was sent to Doug Morgan voicing our displeasure. In short fashion Local 583 heard from the Acting Chief Human Resources Officer Leslie Shikaze. This contact spawned an immediate response and a meeting with her, Labour Relations and the Code’s developer. Local 583’s Executive explained the Calgary Transit culture to Ms. Shikaze and she seemed shell-shocked on our perspective. We were strong on the second-class treatment of Transit employees compared to other City jurisdictions. How, case in point, no one in the City staff is more accountable to more people every day than an Operations employee. We explained our superiors must lead by example and not by disrespect for the work area and biased history they may harbor. Local 583’s Executive is happy that Leslie recognized 8 key takeaways for consideration of the Code’s amendment. Negotiations continue, as slow as they are, but this is a similar scenario to the 1994-1999 contract resolve. Times were tough then with teachers and nurses forced into rollback wages. Local 583 settled for more than two years with no increases and it was the third year before a settlement was signed. There are no rollbacks on the table this round, but the zeros have already been suggested based on Calgary’s lagging economy. The Negotiating Committee still feels there are many working condition gains to be made, despite what is offered. At the end of the day, you the Membership will decide. Below is a guest article written for this newsletter by Aïda Nciri of Climate Hub. Calgarians are speaking up in support of the essential work ATU members do. In preparation for the coming four-year budget, City Council invited Calgarians to share their vision for a “City that moves”. At the committee hearing in September, a stream of people from all walks of life came out to tell City Council personal stories of how Calgary Transit is having a positive impact on their lives. Social justice groups, environmental and climate organizations, mental health support associations and students, had similar stories. Calgarians depend on Calgary Transit to help them commute to work, go to the doctor, attend classes and connect with their community. Their stories reinforced a common message: public transit is a basic component of our community’s social fabric. The Canadian Association of Physicians for the Environment and the Calgary Climate Hub told how Calgary Transit helps Calgary be healthy and safe. More buses and LRT will give us the essential transportation choices we need to reduce the pollution that is harming our air quality and reduce the hot house gases that are disrupting our climate. These were powerful stories of how Calgary Transit benefits our community every day of the year, the speakers asked for more money in the budget to fund low-income transit passes, more transit hours and improved service. Yet, there is more. The Calgary Foundation just published their “Vital Signs Report”. Calgarians ranked improved public transportation as the top issue that needs to be addressed for Calgary to become an even better place to live. ATU 583 members may not fully realize what a positive contribution they are making to our community. Calgarians want Council to adequately fund this essential service so our community continues to become more inclusive, prosperous and climate-resilient. Let’s ensure ATU Local 583 and the community works together to continue delivering this vital message. For Your Information: Our Annual Children’s Christmas Party takes place December 2, 2018 at the Red and White Club starting at 10:30 AM. Please check the bulletins in the usual posting locations for more information.